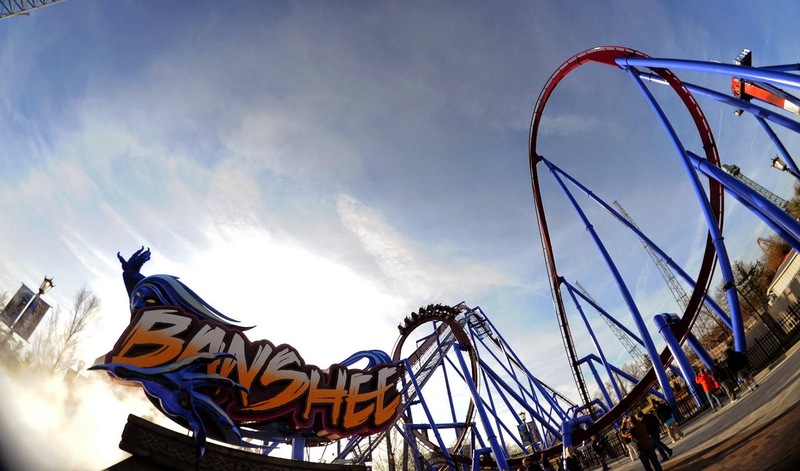 NewsPlusNotes: Scott And Carol Present - Kings Island's Banshee Takes Flight! 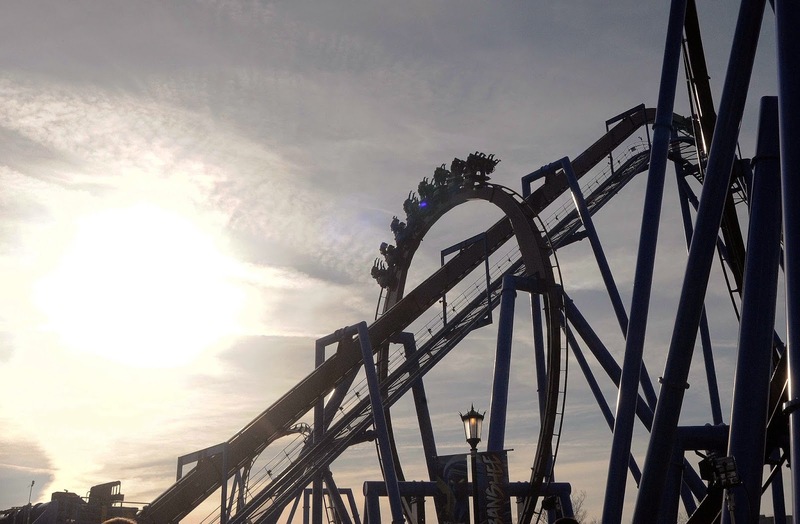 Scott And Carol Present - Kings Island's Banshee Takes Flight! We promised you more, so here is what Banshee looks like after the sun came out to join the festivities. Despite how bright the light, it was still cold until lunch was served. In the foreground is one of the many Gothic lights that adorn the queue and Banshee's station. They flicker, adding that extra touch of foreboding. When Kings Island is open, you can visit the top of the Eiffel Tower for a great view of all the roller coasters, except Flight of Fear, which never sees the daylight. Here is all 4,121 feet of track encompassing seven inversions. The official colors are moonlight blue support structure with mystic red track for the three trains. The 150 foot first drop curves from right to left. No generic cyclone fencing for the restricted areas on this ride! The structure is use to create feelings of closeness as the train flies along the track. Riders swoop low to the ground, which serves to heighten the sensation of speed. Due to no midcourse brake, Banshee actually goes faster after the midpoint due to Bolliger & Mabillard's clever utilization of the terrain. The maximum speed is 68 mph. 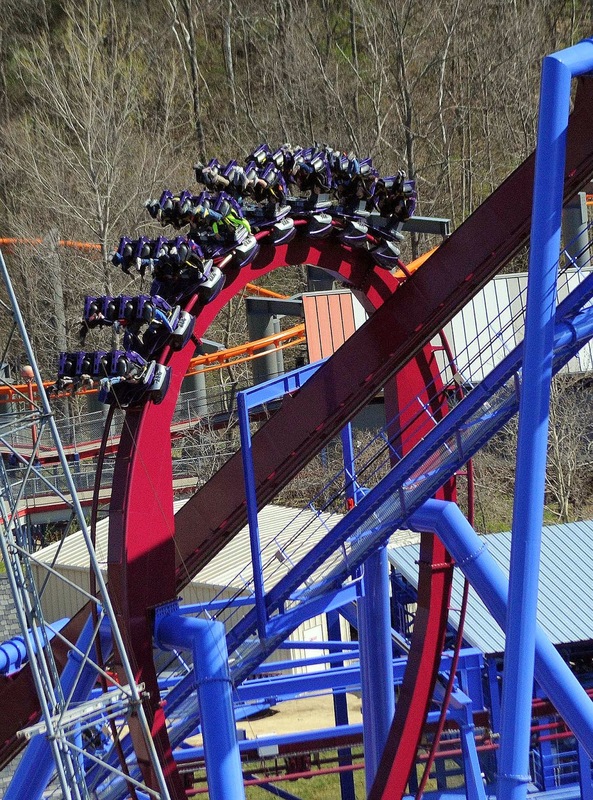 Banshee riders find themselves in this position seven times during the ride experience. 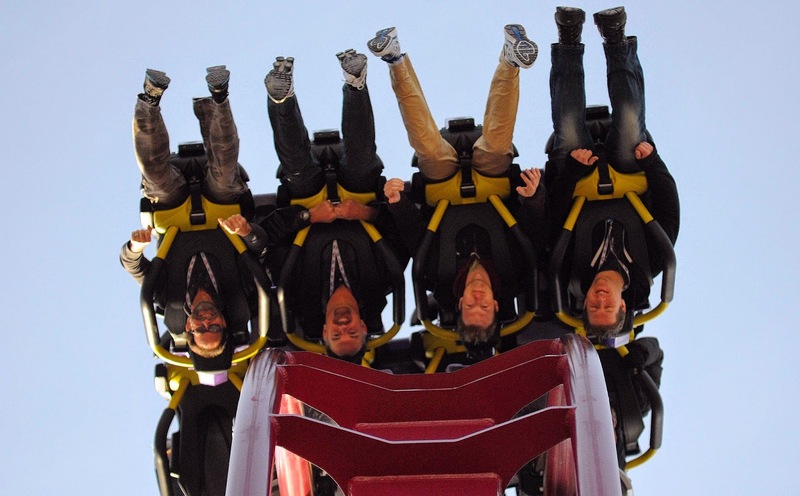 The new spring-loaded "vest" restraints are similar to the wing-rider trains. They do not lock down like the early wing-riders before the update. Greg Scheid, Vice President and General Manager of Kings Island, has nothing but good things to share about the ride, and the process. With this being the largest investment since the opening of Kings Island, it is surely $25,000,000 well spent. Here is the view of the loop over the lift hill from above showing the intricacies of the structure. The large majestic elements proved to be surprisingly forceful, encouraging riders to came back around to ride it again. With a capacity of around 1600 riders per hour, the lines will constantly be moving at Banshee.